Simply Jen: UPDATE on Nick! If you have been following Nick's touching story - I have an amazing update for you! Nick went in for open-heart surgery today to have a large tumor inside his heart removed! I am pleased (or should I say GIDDY!!) to announce that the surgery was SUCCESSFUL! They were able to remove the tumor and the doctors report that he is doing very well! 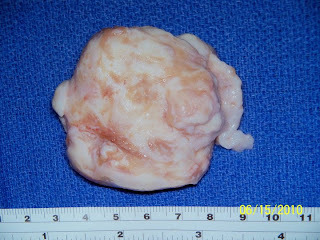 Below is a photo of the tumor. Can you believe this thing was inside his heart?!! His family expresses their deepest gratitude to all who have donated auction items or cookies for the fundraiser and for all those who have given cash donations! And thanks to all of you who have purchased Simply Jen products this past week. A portion of the proceeds have been donated to the family! Further donations are still appreciated and can be given by clicking here.